I haven’t updated my little corner of the internet lately, for a variety of reasons. Not having a computer at home is a big part of it. Plus, I’m working for a start-up in Yaletown full-time, and since we’re in stealth mode I can’t really talk about anything related to work. And, since I work fairly long days and commute almost an hour each way, I don’t really have a huge amount of time to do anything else worth talking about, except watch the occasional movie. And that’s taken care of over on the right there (though I have been thinking for a while about moving my reviews to the main part of the blog). Excuses aside, though, I was all set up to write something interesting about research in Artificial Intelligence, and why I’m so sure we will not have human-level AI in my lifetime. But it’s a beautiful sunny day outside and I spent all week in a stuffy little office, so instead, I’m going to go out for a walk, and then sit in a coffee shop somewhere and read a book, and then maybe go for a run. Sorry, blog. As advertised, the first update on my 2008 resolutions. Because I know you care, and care deeply. And don’t think I’m unaware of my position as role model for today’s youth. First, on my weight. At the beginning of January, I weighed 183 lbs. This was 11 lbs more than the beginning of December, and more than I’ve weighed since 1999 (my weight for the past few years has fluctuated between 160 and 175 lbs). The time had come to do something, though I’m a much bigger fan of slow-and-steady than rapid-and-unsustainable. 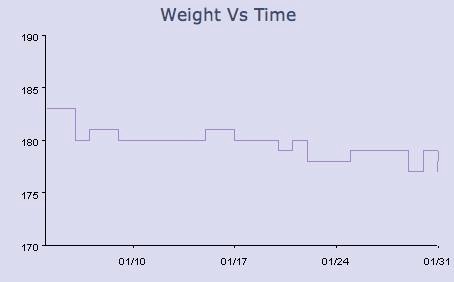 So for January, I simply went back to my pre-December routine of eating reasonably and going to the gym three or four times a week. Six pounds lost with almost no effort. And I’m fairly sure I can get back to 172lbs by the end of February. At that point, the experiments will begin, as I try to get to my ca 2001 weight of 150 lbs and stay there. The most interesting idea I’ve found so far is this one, from economist Richard McKenzie: enter into a contract to pay someone a large sum of money if you don’t meet your weight goal (which should be reasonably attainable). This makes the effective price of something like butter chicken or a cookie far higher than a salad or piece of fruit, and it also means you’re getting paid to go to the gym. While I’m generally not a person to worry too much about money, even when I don’t have it, I’m currently highly motivated to try to save money — I’m working full time right now for express purpose of socking it away for my post-PhD travel fund. I haven’t quite decided yet if I’ll go through with McKenzie’s idea, but it definitely appeals to my fascination with the dismal science. Of course, you could use this trick to motivate yourself into doing anything. I could probably use some assistance in my other goal for 2008 — to improve my guitar skills. I’m going to have to write January off in that regard, but I still plan to focus on getting past my current plateau. On the plus side, I’ve almost made it through all of Guitar Hero II on Hard. Damn you, Free Bird. Damn you, and damn your finger-cramping 10-minute solo.